Directions: Subways F, M (2nd Avenue & Houston ); 6 ( Astor Place ; 8th St and 4th Ave. ); Bus 14A from Union Square (3rd St stop and Ave. A). Robert Scotto was a professor of English at Baruch College , CUNY, until his recent retirement. His publications include a Critical Edition of Catch-22, a book on the contemporary novel, and essays on writers like Walter Pater and James Joyce. His most recent book, the biography Moondog, won the ARSC Award for Best Research in Recorded Classical Music and the Independent Publisher Book Awards bronze medal for biography, both in 2008. 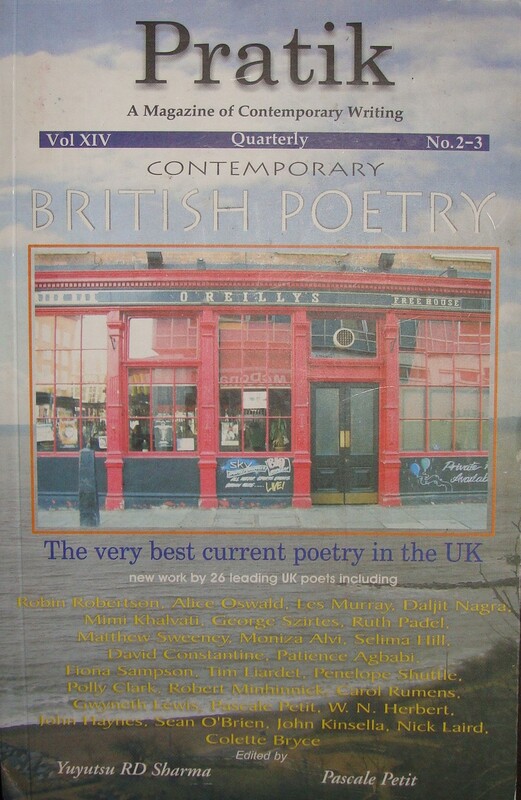 The second edition will appear in 2012. 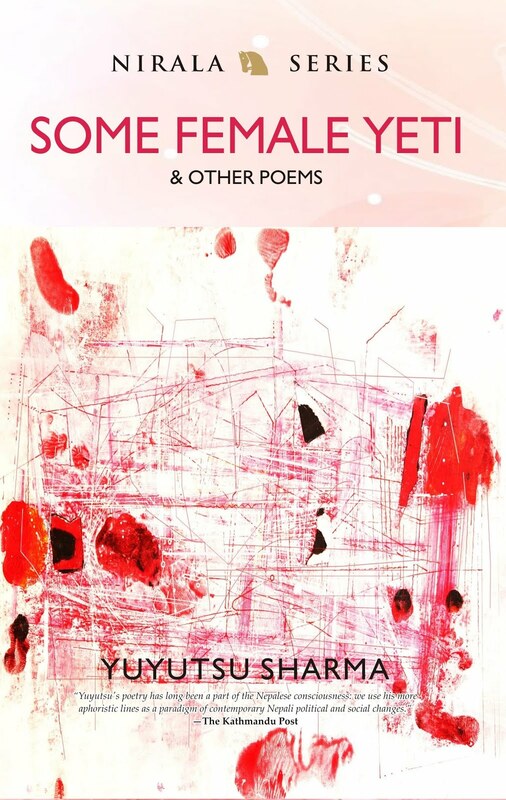 The forthcoming collection of poems to be published by Nirala Publications will be his first. Yuyutsu R.D. Sharma was born in Nakodar, Punjab ( India ) and educated at Baring Union Christian College , Batala and later at Rajasthan University , Jaipur. He remained active in the literary circles of Rajasthan and acted in plays by Shakespeare, Bertolt Brecht, Harold Pinter, and Edward Albee. Later he taught at various campuses of Punjab University , and Tribhuwan University , Kathmandu . 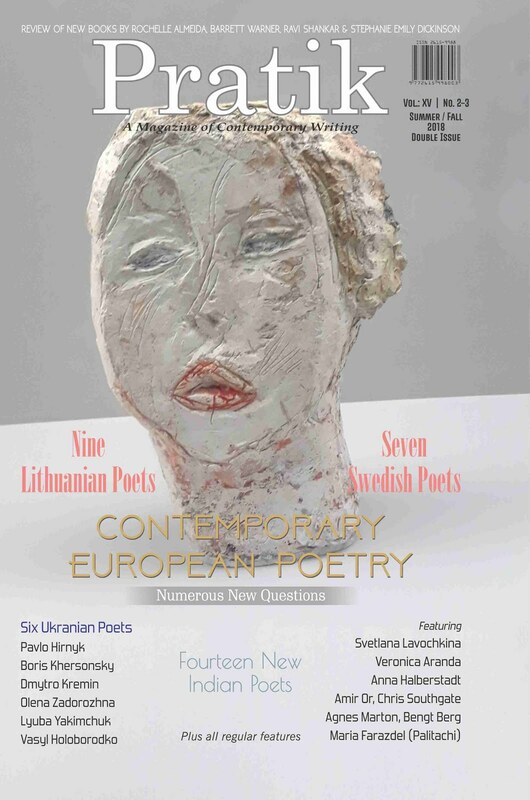 A distinguished poet and translator, he is the recipient of numerous awards, fellowships, and grants from The Rockefeller Foundation, Ireland Literature Exchange, Trubar Foundation , Slovenia , The Institute for the Translation of Hebrew Literature, and The Foundation for the Production and Translation of Dutch Literature. 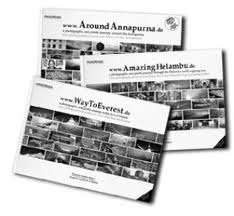 He has published eight poetry collections including, Space Cake, Amsterdam, & Other Poems from Europe and America, (Howling Dog Press, Colorado,2009); AnnapurnaPoems, (Nirala, New Delhi 2008); Everest Failures (White Lotus Book Shop, Kathmandu, 2008); The Nepal Trilogy (Parts I-III), Photographs and Poetry about the Nepal areas of Annapurna, Everest, Helambu & Langtang, 2010, with German photographer Andreas Stimm; a translation of Hebrew poet Ronny Someck’s poetry in Nepali in a bilingual collection, Baghdad, February 1991 & Other Poems. 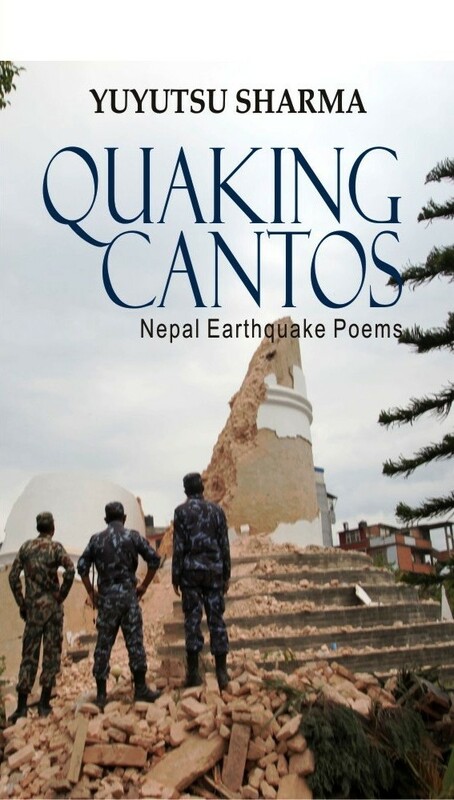 He has translated and edited several anthologies of contemporary Nepali poetry into English. The literary movement, Kathya Kayakalpa (Content Metamorphosis) in Nepali poetry was launched by Mr. Sharma. Currently, he edits Pratik, A Magazine of Contemporary Writing and contributes literary columns to Nepal ’s leading daily, The Himalayan Times. 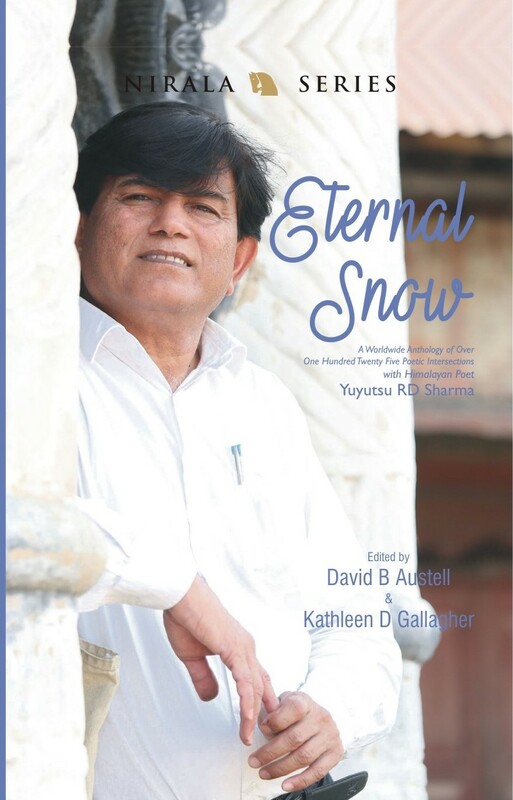 Yuyutsu Sharma reading "Little Paradise Lodge"
Poetry and Heights: Readings by Yuyutsu Sharma and David Austell . on the Himalayas and Olympus Mons. 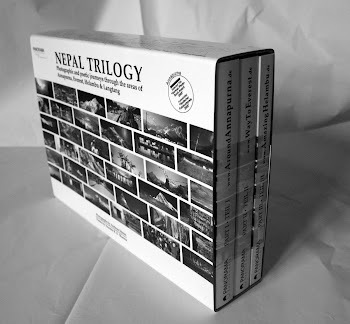 Yuyutsu Sharma will read from his new poetry/picture book, Nepal Trilogy (www.nepal-trilogie.de, Epsilonmedia, Germany), authored with German photographer, Andreas Stimm. Yuyutsu R.D. Sharma was born in Nakodar, Punjab (India) and educated at Baring Union Christian College, Batala and later at Rajasthan University, Jaipur. He remained active in the literary circles of Rajasthan and acted in plays by Shakespeare, Bertolt Brecht, Harold Pinter, and Edward Albee. Later he taught at various campuses of Punjab University, and Tribhuwan University, Kathmandu. 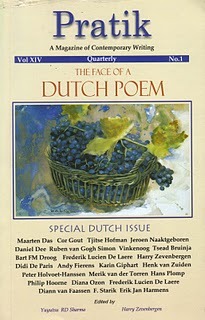 A distinguished poet and translator, he is the recipient of numerous awards, fellowships, and grants from The Rockefeller Foundation, Ireland Literature Exchange, Trubar Foundation, Slovenia, The Institute for the Translation of Hebrew Literature, and The Foundation for the Production and Translation of Dutch Literature. 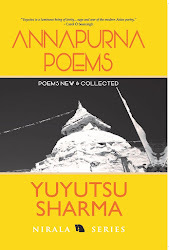 He has published eight poetry collections including, Space Cake, Amsterdam, & Other Poems from Europe and America, (Howling Dog Press, Colorado,2009); AnnapurnaPoems, (Nirala, New Delhi 2008); Everest Failures (White Lotus Book Shop, Kathmandu, 2008); The Nepal Trilogy (Parts I-III), Photographs and Poetry about the Nepal areas of Annapurna, Everest, Helambu & Langtang, 2010, with German photographer Andreas Stimm; a translation of Hebrew poet Ronny Someck’s poetry in Nepali in a bilingual collection, Baghdad, February 1991 & Other Poems. 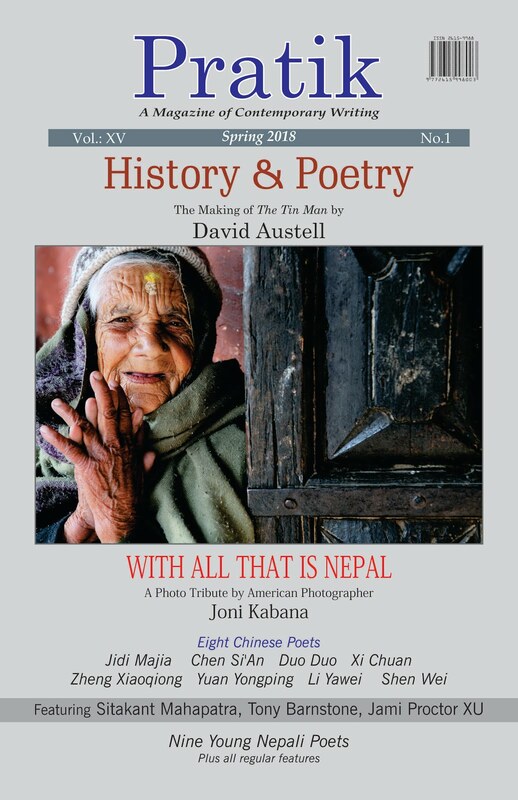 He has translated and edited several anthologies of contemporary Nepali poetry into English. The literary movement, Kathya Kayakalpa (Content Metamorphosis) in Nepali poetry was launched by Mr. Sharma. Currently, he edits Pratik, A Magazine of Contemporary Writing and contributes literary columns to Nepal’s leading daily, The Himalayan Times. or rhymes that sing of flowers of freedom. in murky skies of their fast fading infancy. And it doesn’t rhyme either. Not for those who know what life is like there and which challenges people face there day after day. Not if you are out to find something different from the natural template for an oil painting or a picture postcard. Not if you are a cosmopolitan Nepalese poet who refuses to write either paddy harvesting song or Bollywood ballad lyrics. For these people Nepal is a challenge and this book is an attempt to come to terms with that challenge. A Mitteleuropean sets out to chart and take pictures of his ventures through the most incredible mountains in the world. And its incredibleness consists neither in us being romantically moved nor in the kick which crossing boundaries may bring: there is no call of the wild, no Walli serenading her complaint, neither do we find our true inner self nor does Shangri-la shine down upon us. What is incredible is that here and maybe more than anywhere else en route on the fringes of the world we encounter people and share their company. That we become even if only temporarily involved in networks or silently pass through them. And each time we are made to notice that the balance between living and working together, preparation and improvisation, encounter and departure is nowhere as decisive as in places where with each step you find yourself on the verge of an abyss. Andreas Stimm‘s pictures manage to find that balance, because the breadth of their field require you to linger which empowers the wandering eye. Because they deploy, mediate and inscribe the technology that produced them and that always betrays its origin in a human enterprise which is larger than oneself and which refers back to him or her who reads and beholds, for whom the travelling photographer prescribes routes and enables travels. Because they create enough space to locate the individual: he who takes us with him, who holds and uses the camera and through whom we see. And those individuals who inhabit these spaces, for whose paths, places, work and living conditions the frame has been formatted generously enough to have them be part of the picture. 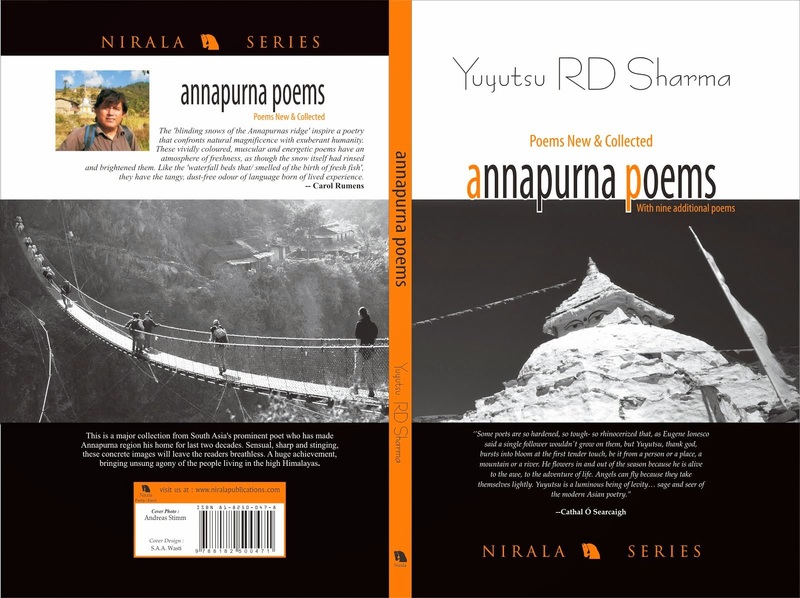 The Indian-born international Nepalese poet Yuyutsu R.D. Sharma takes part in this voyage and his texts are the images’ eloquent partners. 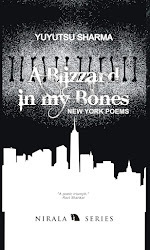 Formed by 20th century South Asian and North American poetry movements and himself a verbal renewer of his country’s literature he indefatigably writes along rivers and paths, mountains, valleys and villages, verse after verse, one image after the other, an encounter at a time. And not infrequently the travelling reader is taken by surprise by an image which unexpectedly turns on itself. Which reminds the reader that, in contrast to our own wishful thinking, poverty does not make for happy people, or that those whom we encounter on the way do not lend themselves to be sparring partners for buffering our own political correctness. But that instead we better hold ourselves accountable for our bipolar sensibility, indebted to our globally urban taste regarding both the beautiful and the terrible and that under such extreme conditions as those found on a trip to the ends or rather the roof of the world one can easily turn into the other. That which keeps poetically hitting us in the face along the way is nothing else but the idiosyncrasies of our very own likes and dislikes, desires and fears. Yuyutsu‘s texts in as far as they help illuminate further Andreas Stimm‘s images also show us, however, that, once we give it a voice and an image it is the poetic, creative sensibility with its light and dark, its calculating and impulsive sides which enables us, the photographer, the poet, the reader and all those people who make their way through the mountains to see when and where our various paths may, now and then, cross.